Uncertainties in our knowledge and understanding of the frequency and magnitude of extreme flood events mean that absolute safety from flooding is a myth. A false sense of security fostered by the suggestion that humans can fully control floods can lead to disastrous consequences in the case of an extreme event. Further, these uncertainties are increasing due to increasing climate variability and climate change. Structural measures (i.e. dikes, bypass channels, reservoirs etc.) provide protection up to a certain pre-determined safety level. When implementing those structural measures there has in case been too little consideration of what measures are required to handle the residual risks due to failure of the protection measures, due to overtopping or otherwise in an extreme event. The ecological, political and financial costs associated with implementation of such structural measures are in many cases not appropriately factored into flood management decision making. In particular in highly decentralized administrative settings where flood management decisions are taken on a micro-scale level (e.g. within a municipality, or a state), flood risks are simply shifted without taking into account their impacts on a basin scale. Such isolated measures do not mitigate the problem but tend to shift the problem spatially or temporally. This often leads to political conflicts and to high financial costs. 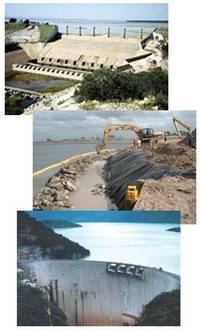 Civil engineering has been the core discipline on which the flood control approach has been founded. While civil engineering must remain central to flood management it is undeniable that inputs of various other disciplines are required to develop integrated flood management strategies. Approaches based on the expertise of only the civil engineers (by definition of their function) tend to be biased towards certain measures without fully appreciating the set of available options. Adverse consequences of a mono-disciplinary approach are common as elements of the hydrological cycle other than surface water, the health of the riverine ecosystem or the social conditions and social capital of affected communities, are generally ignored. Even though floods are generally an outcome of a complex interaction between natural phenomena and human activities, flood management is rarely mainstreamed and prioritized in development policies. Where land is under development pressure, land use planning pays little attention to flood management and is generally adapted to development demands. Such measures often reduce the socio-economic development potential of floodplains. Too often the immediate political response to large scale economic flood losses has been to propose schemes to relocate the population or severely restrict development on flood plains. Too little attention has in many of those cases been placed on the linkage between floodplain resources, livelihood generation and the role of other risks affecting flood plain populations, in particular their vulnerability due to prevailing poverty conditions. Reactive flood management leads to high costs for recovery and rehabilitation and results often in ad-hoc measures that are not sustainable. It is a delicate balance which politicians need to maintain in their political response to a large flood event, reassuring the population and at the same time keeping in view a long-term perspective of sustainable development. As such, after an extreme flood event, with mounting public pressure for more protection from floods, it is tempting for political leaders to reassure the population by (re-)adopting a flood “control” policy. Such policies go on to suggest that massive public investment into flood defences (apparently more visible) could solve the problem alone, instead of addressing the whole array of flood management options, which are possibly less visible. This is a challenge which flood managers can help ward off. Political leadership is required as scarce resources make it difficult to pay for proactive flood management if the traditional system of paying for disaster rather than preparedness is still in place. The exclusion of affected individuals and communities in the decision making process often results in ignoring local interests, generation of conflicts, lack of ownership at the local level and the selection of a sub-optimal flood management measures. This approach looses an opportunity to use existing local resources and advantage of being familiar with local conditions and indigenous means of protecting the community and their surroundings.